Wonder Woman soars down and searches the part of the technobase wreckage that Clark is buried under. As the press arrive, so too does Lois Lane and her bodyguard Metallo. Under instruction from Lois, John Corben assists Wonder Woman in her search and hearing them Clark bursts out of the ground in a fury. Clark is surprised by Metallo's presence and realizes that Lois is looking out for him. Asking for John and Diana's assistance they attempt to enter the base again only to be thwarted by feedback from the forcefield protecting it. As they look skyward they see the comet approaching. As it draws closer all of Vandal's children begin to experience a supercharge of their abilities. Hordr watches as they all thrive but he doesn't experience the same ecstasy and turns to his father for an explanation. Vandal explains that as he has no pure body, jumping instead from node bodies he cannot harness the power of the comet. When Hordr_Root protests Savage orders Salvaxe to kill Hordr. Clark's new powers allow him to 'hear' the goings on inside the base and recalling how Bend had harnessed the powers of super villains, this time the Justice League were being used as batteries instead. Clark turns to John and orders him to expose him to Kryptonite radiation and Lois sees that Clark can now harness and channel the radiation. As Vandal instructs his children to attack Clark, Diana and John, Mr. Terrific orders reinforcements to aid them. 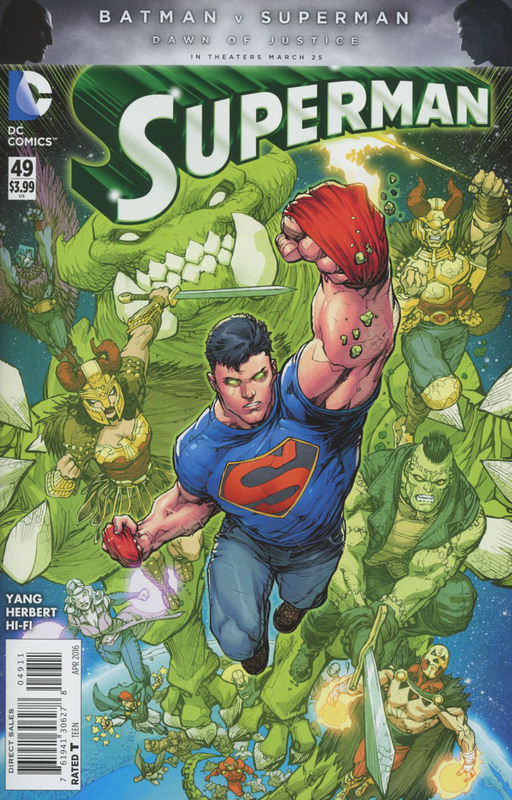 Corben whose primary directive is to protect Lois races to her aid as Superman, Wonder Woman, the Mythbrawlers, Baka, Frankenstein and others arrive to fight the Savage offspring. Realizing Clark needs Kryptonite to remain super, Lois refuses Metallo's protection and races into the fight herself forcing him to assist her. Shocked by Lois' aid Clark and John race to break through the forcefield. John is blindsided by an explosive blast that rips his chest cavity open. Vandal watching via hologram invites his son into the base to join him but in doing so the jealous children left behind begin running riot not only fighting the heroes but also themselves, struggling for approval. As Lois cradles a dying Corben he tells her that that was all he ever dreamed of. John tells Clark that despite the supercharge from the Kryptonite and its chemotherapy effects, it will eventually do as it always has and lead to his death. Clark is still determined and when John realizes that no matter what Clark is willing to die to save everyone, he asks Clark to take his heart. Lois begs him not to sacrifice himself but John turns to Clark and tells him that though his heart was always for Lois, Clark's heart is for everyone. As John powers down, Clark reaches into the cavity and absorbs the Kryptonite power and uses its might to finally shatter the forcefield allowing him entry to the technobase. Story - 4: Yes, the finale is pure cheese, the cheesiest of cheese, nevertheless this was just as enjoyable as Superman/Wonder Woman #26. The thinly veiled redemption of Lois Lane was welcome as it put her back in a positive light and made Clark think. Some of the story felt rushed, forced, to fit into the issue which is a shame, as there were just so many characters it was difficult to keep track of who was who. As mentioned last month Yang has benefitted greatly by becoming part of the 'real-time' story. The action refused to let up and that made for a really good pace, but as I said there was just too much packed in here. If some of the moments were given time to breathe and the schmaltz toned down I think this would have been a solid 5/5. Art - 5: Great art this issue. Jack Herbert certainly did the issue justice taking on the art chores this month. Some great moments, here, some panels so fast the details were perhaps lacking and lettering/editorial could have aided there with character identities, but overall I really enjoyed the whole book. Cover Art - 4: Howard Porter might have been missing this month on interior art but the cover has got that x-factor that makes for a winning piece of art. Clark looks a bit young and more like his classic self or a little like Conner Kent perhaps and less of a thug. Whether it is full color (A) or the green glow special (B) the artwork still really pops. 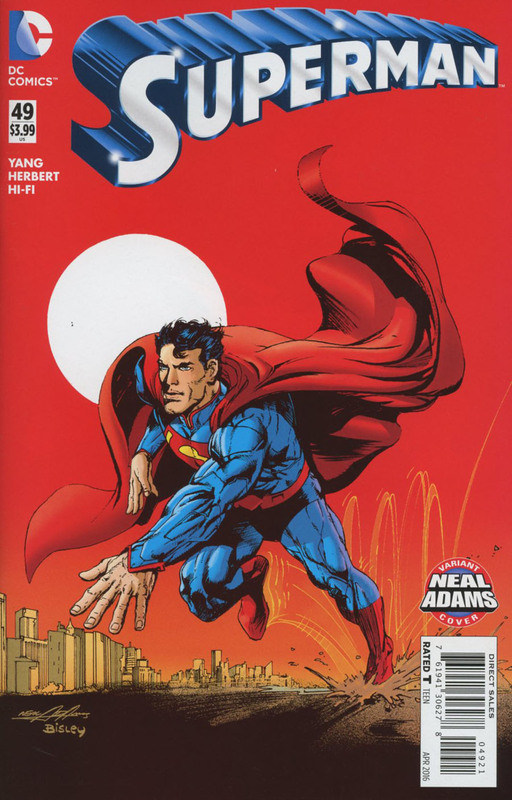 Neal Adams Variant Cover Art - 5: WOW! This is my absolute favorite of the Neal Adams variants. I know it is an adaptation of a classic Batman pose but it is just fantastic.